The Cardinals of the Roman Catholic Church have elected Cardinal Jorge Mario Bergoglio to be the new Pope Francis! We would like to take this opportunity to thank all that have prayed for the Cardinals iduring the conclave and we encourage you to continue in your prayers for the Pope and the Cardinals! At the end YOURS was one of 552383 adoptions! Together we are one body! We therefore encourage you to continue in prayer and intercession before God! Although the conclave is now over we are sure that the Cardinals still need your prayers so that the Holy Spirit may lead them to do God's will every day of their lives. We also ask you to pray for your local parishes, your priests, your bishops, the Seminarians in your diocese, ... you name it! 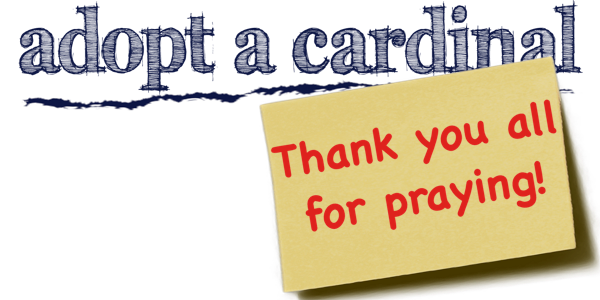 If you want to give testimony, have something to share with us or would like to ask a question then please don't hesitate to contact us via contact AT adoptacardinal DOT org!